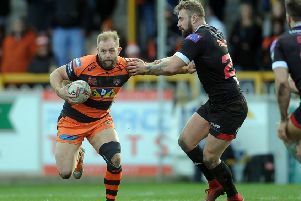 Castleford Tigers boss Daryl Powell is predicting a potential classic derby when Wakefield Trinity arrive at a packed to the rafters Mend-A-Hose Jungle tomorrow. Powell is impressed with the job being done by Wakefield head coach Chris Chester and reckons they will provide a stiff test for the top of the table Tigers. Victory can give Trinity a rare place in the top four so there is more than just bragging rights at stake. “I’ve watched their last three games, there’s a lot of ball movement in them, they are playing with confidence, put you under pressure and the half-backs are playing really well,” said Powell. “Fifita’s a real handful of a player, Johnstone’s great on the wing. They look a well balanced team and look like they are enjoying themselves. “It’s a derby and the way they are playing and the way we are playing it promises for a great game. Both teams go into tomorrow’s game on the back of three straight wins and Powell admits Cas took a lot out the way they won 27-10 at Wigan. He said: “It was obviously a really good performance from us after a tough start. It was really pleasing to get the two points in the manner that we did. We had to dig ourselves out of a tough spot and defend really well. It was another tick in the box for us. “We’re confident, we have to be. The players have looked in great nick, they’ve trained really well. The two sessions we’ve had this week they’ve recognised the strengths Wakefield have got and are looking to get after them, stop them doing what they want to do. “There’s some clear elements to their game that have been successful and we need to negate those and try to impact our game on Wakefield. If we can do that we can be confident. “Wakefield are playing great, they’re really happy with where they’re at and so they should be. “I’m pleased for Chris Chester, I think he’s done an outstanding job there, and it’s a battle of a couple of teams that are on form at the moment. Powell has several players to check on before he names his team against Wakefield, but wants to field his strongest possible team before utilising his squad in the second Easter game at St Helens on Monday. He added: “Grant Millington didn’t play last week because of a head knock and he needs a head assessment. Junior Moors has a bit of a hamstring and we’ll check on him as well and Oliver Holmes who hasn’t trained yet this week with a bit of a knee problem. “I’m not sure with Michael Shenton. His back locked up in the warm-up at Wigan, but hopefully it’s not too bad.